Two failed actors decide to pull a con on a local gangster by pretending to be the people to whom he owes money. Anthony O'Malley: And we are sad men, awaiting advice from a nine year old girl. Tom Quirk: But we're big enough to accept that. The Actors is never going to win any awards for originality, ingenuity or cinematography, but what it does do is to entertain without ever remotely taking itself seriously. 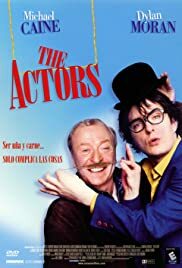 Michael Caine (The Quiet American), Dylan Moran (Black Books), and Michael Gambon (The Singing Detective) star as 2 actors who are down on their luck, and one apparent gangster (Gambon) who the actors will try to exploit. Of course the scheme doesn't quite work out as planned, and the yarn spins out thereafter. All the players appear to enjoy themselves tremendously. Gambon and Caine especially give the impression of enjoying this light relief as a little break from their more 'serious' roles. And Moran is just excellent in comedy anyway as proven by the British TV comedy, Black Books. Forget what the critics say, this is a blast assuming you don't expect an intellectually stimulating comedy.